Ruben Ramirez joined Florida’s Python Challenge. About 100,000 pythons are estimated to live in the Everglades. WASHINGTON — Only in Florida can a search for one invasive creature lead to the discovery of another. On a balmy Sunday recently, a group of volunteers called Swamp Apes was searching for pythons in Everglades National Park when it stumbled on something worse: a Nile crocodile, lurking in a canal near a Miami suburb. It was an all-points alarm, prompting an emergency response by experts from the national park, the Florida Fish and Wildlife Conservation Commission, and the University of Florida. They joined the Swamp Apes and wrestled the reptile out of the canal. Nile crocs are highly aggressive man-eaters known to take down huge prey in Africa, and officials worried that the one in the canal might be breeding in the swamp since it was first spotted two years ago. Worrying is what Florida wildlife officials often do when it comes to invasive species. The state is being overrun by animals and plants that should not be there, costing Floridians half a billion dollars each year in everything from damaged orange groves to maimed pets and dead fish in water depleted of oxygen by plants. Florida spends $50 million a year just to eradicate invasive weeds from fields, pastures, and canals. Yet the problem is getting worse. Native Florida alligators are already in a death match with giant Burmese pythons and other python species to sit atop the food chain. Other invasive species include the Argentine tegu, which eats sea turtle eggs; the Nile monitor lizard, which kills house pets; the Cuban tree frog, which dines on other frogs; and the lionfish, which is eating scores of native fish. Last year, Florida organized a month-long hunt, called the Python Challenge and enlisted volunteers to help remove its top-priority invasive species from the Everglades. When it was over, the state fish and wildlife commission and other experts came to this conclusion: Evicting the snakes is impossible. 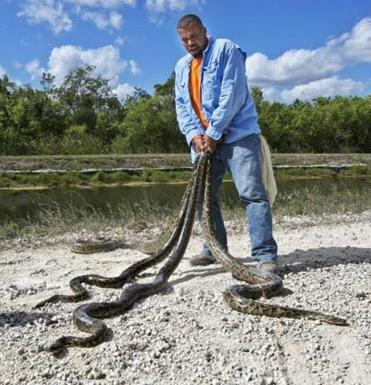 Up to 100,000 pythons are estimated to be living in the Everglades, and more than 1,500 thrill-seekers, amateurs, and skilled hunters who flocked to the event from across the country caught only 68. Pythons are excellent at stealth. Trackers with the US Geological Survey have stood a few feet from them — with radio transmitters — and failed to see them. In the challenge, 24 hunters with permits caught 42 snakes. About 1,500 others caught 26. The Florida Fish and Wildlife Conservation Commission ruled out a second challenge this year, partly because pythons are so hard to spot, let alone catch. They were looking for signs that pythons are behind the disappearance of other animals in the Everglades, such as raccoons, rabbits, and foxes.